The role of any transmission is to prevent the engine from overexertion while transferring its power to the wheels. A manual transmission accomplishes this through different gear combinations that ensure the engine is below its ‘redline’ while still producing the greatest amount of torque and horsepower. An engine’s ‘redline’ is the maximum number of revolutions per minute that it can sustain without exploding. 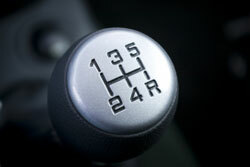 In a vehicle with a manual transmission, the driver locks and unlocks sets of gears with the clutch pedal and shifts between them with the gearshift. Our technicians are highly trained and frequently attend seminars to update their skills. We feel confident that we can find a solution to any of your transmission troubles. So whether you need a specific repair, or just want to stay on top of maintenance, bring it by The Car Works!. Our service and repair center is located just outside of Warren, RI. A clutch is made up of three main components—the pressure plate, flywheel, and clutch disc. These elements work together to transfer power from the engine to the transmission while also allowing the engine to continue running when the wheels are stopped. The first component is the flywheel—a large metal disc that is bolted to the crankshaft of the engine. Attached to the flywheel is the pressure plate, which is essentially a spring-loaded clamp with a sheet metal cover. The clutch disc is a steel plate covered with a frictional material that fits between the flywheel and the pressure plate. When the clutch is engaged, the pressure plate squeezes the disc against the flywheel, effectively transferring power from the engine to the transmission. If the pressure plate is malfunctioning, it will not be able to apply enough pressure to hold the clutch disc against the flywheel and power will not be transferred. Some symptoms of a failing pressure plate include clutch slippage, inability to engage transmission into gear, a shudder when the clutch is engaged, and noise or vibration in the clutch. If you’re experiencing any of these issues have your vehicle looked at by a professional as soon as possible. The Car Works! has expert technicians and a state of the art service center in Warren, RI. The clutch is responsible for transferring power from the engine to the transmission and the drive wheels. Engaging the clutch initiates this transfer while disengaging it prevents power from going to the transmission. The component of the engine that connects to the clutch is called the flywheel. The flywheel is a metal disc that is attached to the engine’s crankshaft and provides a friction surface on which the clutch can link to. In addition, the flywheel acts as a balancer for the engine, limits its vibrations, and transfers power from the starter to the engine. Because the flywheel is exposed to pressure and extreme heat, it is prone to becoming worn, warped, or cracked. Symptoms of a bad flywheel include vibration through the clutch, a burning smell, and clutch slippage. At The Car Works!, we recommend having your vehicle’s clutch and flywheel checked periodically for wear to prevent more expensive damage down the road. Our expert technicians take pride in providing the Warren, RI area with quality, affordable auto repair. If you’re experiencing any issues with your clutch, don’t hesitate to bring it to our Warren, RI service center. At The Car Works!, our goal is to keep your car running smoothly for less! The clutch’s slave cylinder is part of a hydraulic system that converts the force of your foot hitting the pedal into hydraulic pressure. Consequently, when there is a leak in the cylinder, fluid is released and air is let in. This will cause your clutch pedal to feel soft or loose when pressed. There are several other major signs that your clutch is leaking including: low fluid levels, trouble shifting gears, and dark liquid on the ground below the slave cylinder. If you’re experiencing any of these issues, bring your vehicle to our service and repair center, located in Warren, RI. One of The Car Works! expert technicians are ready to get you shifting smoothly again!